Summary: Peter Huang and his sisters—elegant Adele, shrewd Helen, and Bonnie the bon vivant—grow up in a house of many secrets, then escape the confines of small-town Ontario and spread from Montreal to California to Berlin. Peter’s own journey is obstructed by playground bullies, masochistic lovers, Christian ex-gays, and the ever-present shadow of his Chinese father. Review: I’ll be honest. I was hooked in by the cover design, which is gorgeous. (It looks even more beautiful in person.) When I read the description, I thought — I’ve got to read this. I read For Today I Am a Boy on a three hour train ride. When I got off the train, I still had the last quarter of the book to go, so I walked about the city in a daze, still reading. For Today I Am a Boy matches its cover — it’s beautifully written and utterly heartbreaking. The story of Peter’s life, from her childhood to her thirties, is told in a series of memories, conversations, and moments all woven together. While far from straightforward and linear, it’s still very easy to fall into the rhythm and flow of the story. 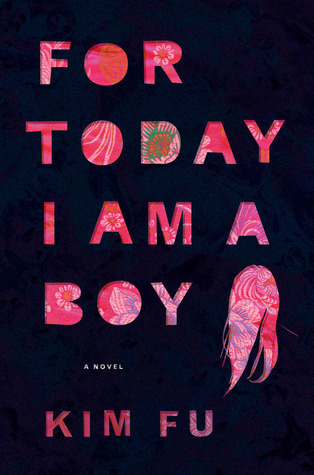 At first glance, For Today I Am a Boy seems to be an issue novel about growing up as a transgender girl, but it’s not quite that. Though Peter yearns to be the girl she knows she is, the pressure and influence of her father forces her to conform to his standards of masculinity, even as her sisters’ flee from their father’s control. This is a story as much about sisterhood and culture as it is about gender identity. Fair warning, the book is incredibly grim for a large part of the book (despite an ambiguously happy ending). Do not read this as a pick-me-up. I would hesitate to say that For Today I Am a Boy is strictly Young Adult literature, but I wouldn’t call it adult literature either. (What defines YA lit, anyway?) That being said, the categorization is unimportant. For Today I Am a Boy is a beautiful and incredible read that I would absolutely recommend to just about everyone. EDIT: This book grapples with a number of issues, including homophobia, transphobia, sexism, assault, and more. Please be aware that this is not a light book and can be triggering. For an article that discusses the book’s problems with trans representation, please read this. *Rating has been revised after further reflection.